Manhattan has a new avenue just for foot traffic. The mid-block stretch of public plazas from West 51st to 57th streets between Sixth and Seventh avenues has been newly christened 6 1/2 Avenue. Savvy pedestrians have been using the string of plazas in the area as a shortcut for years, but the Department of Transportation hopes that the official six-block-long avenue will be safer for walking. 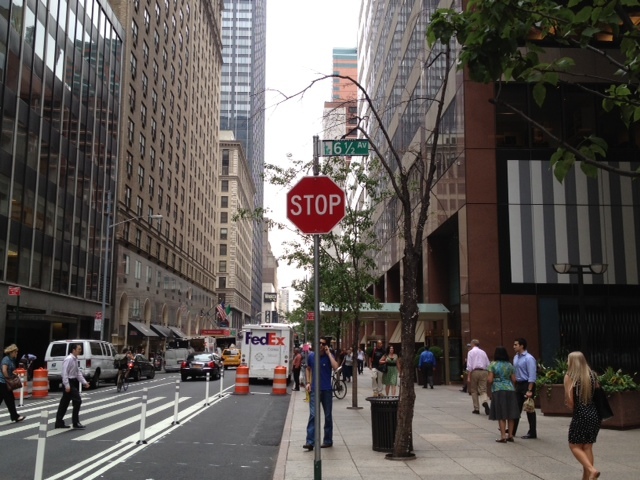 Stop signs have been installed at each crosswalk between West 51st and 56th streets, along with a traffic light at the corner of West 57th Street and 6 1/2 Avenue. The freshly minted avenue has been over a year in the making as part of a $60,000 Department of Transportation project. You can check out snapshots of 6 1/2 Avenue at Transportation Nation. 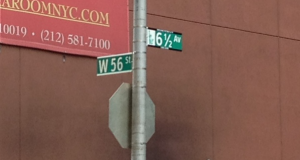 How long do you think it will take before someone attempts to steal the neat-looking 6 1/2 Avenue sign?